A simple and fast paced top down arcade-style game! Push carts and try to get the highest score possible. If you're too slow, you will lose! If you get dehydrated, you will lose! Each cart you return gets you 1500 points. But watch out! 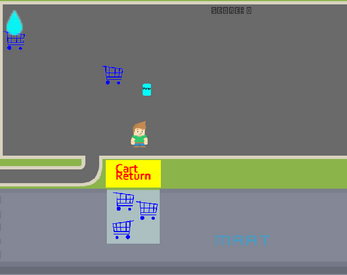 The carts spawn increasingly fast!! Still, remember to stay hydrated. You can’t win this game. Everybody loses at some point. But the longer you last and the more carts you return, the more points you earn. The score leaderboard stores the top 10 local scores. A future update will provide server-side high scores so you can compete with players across the world! Made for GamesPlusJam, February 16-18th, 2018.